Eurocom is now shipping the Monster, high performance, upgradeable, small and lightweight notebook preloaded with Linux Operating System. Customer can choose between Windows 8, Windows 7 and Linux based operating systems such as, but not limited to Ubuntu, Mint, Debian and Fedora. At Eurocom, the customer has a great deal of choice when ordering their new laptop or notebook. Users can choose between a variety of processors, storage drives, memory, displays, keyboards and even operating systems for their little Monster. “The EUROCOM Monster gives users an ultra portable to travel with and go back and forth from School or the office. The EUROCOM Monster is like we stuffed a High Performance Notebook into a Netbook form factor, the Monster is the perfect system for enterprise class users running multiple VMs that require a small package and extremely easy mobility” Mark Bialic, Eurocom President. Linux based operating systems are less prone to virus attacks, are very secure, while having a stylish and intuitive interface. Linux distributions give users a beautiful, streamlined experience that they can really make their own. During the purchase process customers can configure the Monster with processors up to Intel Core i7 Processor Extreme Edition. Memory can be configured from 4GB of DDR3-1600 or 1866 to 16GB. Eurocom offers a variety of storage options including SSDs from Crucial RealSSD C400, Intel SSD 520 series, Hard Drives from Hitachi Travelstar 5K1000, Western Digital and Hybrid Drives from Seagate. Even wireless technology, keyboards, displays, warranties and TV tuner cards can be customized, along with Operating Systems. At Eurocom customers get exactly what they want and the in the future have the ability to upgrade their system because Eurocom continues to offer upgrade service for past models. At the core of the EUROCOM Monster, users have an NVIDIA GeForce GT 650M to do their bidding, with 2GB of video memory, 384 cores, with the graphics clock running at 850 MHz this new graphics powerhouse is the ultimate mobile gaming and professional machine, all in a super small and portable form factor. 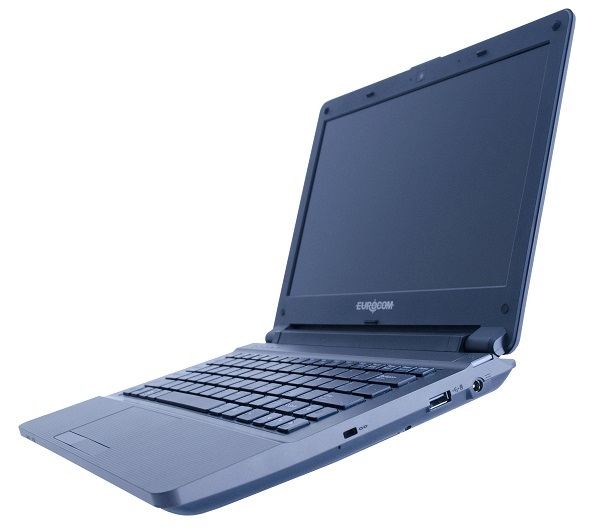 The EUROCOM Monster can run for up to 410 minutes on one charge. The EUROCOM Monster is a highly customizable notebook with the ability for the customer to choose a variety of processors, storage drives, displays, memory capacities, warranties, operating systems. At Eurocom, customers get exactly what they want and the in the future have the ability to upgrade their system because Eurocom continues to offer upgrade service for past models. “The Monster is a small form factor ultraportable notebook capable of running multiple virtual machines and multiple operating systems with up to 16GB memory and 1.5 TB storage while weighing under 4 lbs and having a battery that lasts over 400 minutes!” Mark Bialic, Eurocom President.